Our storm is now well underway and it is behaving exactly as we thought it would. Warm air is flooding into the region on strong SE winds. These winds will continue to intensify with the storm. I recorded .73 inches of precipitation this morning and it it still raining hard. I expect the rain to continue through the day tapering to showers as the evening approaches. Winds should start to let up this afternoon but will re-intensify out of the NW overnight ushering very cold air for the remainder of the week. For those who shop on Black Friday, you will encounter very, very cold temps and bitter winds. Our storm we have been looking at for a week or so is now kicking into gear over the southeastern US. Rain is spreading northward covering most of the Mid Atlantic states and moving into NYC right now. This morning’s precipitation was unrelated associated with a weak warm front that dropped about an inch or so of snow. That is now long gone and temps today will rise to near 40 at the coast and 30 inland. Precipitation should arrive just after sundown tonight becoming heavy at times. Winds and rain will both pick up in intensity by morning with the worst conditions arriving mid-morning. Rain and wind will continue through the afternoon with the rain diminishing in intensity while the wind holds steady at about 40-50 mph. Wind and rain will diminish in intensity and coverage Wednesday night as the front passes through. We may see a quick shot of snow early Thursday morning but accumulations should be limited to a dusting at best. Winds will become strong out of the NW much like those we saw on Sunday for Thanksgiving day. The mountains should see some up-slope snow showers accumulating 2-4″ in favored zones. I expect near 3-3.5″ of rain over the area which will cause a rapid rise in streams and rivers despite a relatively dry October-November. Minor flooding could become an issue with very heavy rain rates Wednesday morning. Winds will gust near 50 mph over coastal areas with 40 mph winds inland. With the ground saturated from the heavy rains, power outages will become an issue. Winds will increase out of the SE tonight ahead of the storm and steadily strengthen. Winds will peak between 9 am and 1 pm and subside after that. Winds will again become gusty on Thanksgiving but out of the NW ushering in cooler air. If anything drastically changes, I will have another update tonight but otherwise, I’ll have another update on Wednesday morning. With the storm only 2 days out now, we have a much clearer picture of what will play out over the Eastern Seaboard on the busiest travel day of the year. It looks like the coast will be all rain while inland areas will start with snow then switch over to rain as the day goes on. Even the highest elevations will see rain at some point Wednesday with temps reaching into the 50’s on the coastal plain and 40’s inland. This is my thinking as to the type of precipitation. I expect the only spot in New England to see accumulations will be NW Vermont. The big cities and the I-95 corridor will see a windswept rain shown in green while freezing rain and sleet could cause problems in the purple shaded area. Accumulating snow, shown in blue will be confined to areas like State College PA and Buffalo NY. Rain will be the main story with this storm as the westerly track will put most on the warm side of the low. Accumulations of 2-5″ will be possible region wide with the bulls eye being over central CT. Minor street flooding could become an issue especially in CT where the heaviest rain will be focused. Rain will begin late Tuesday night over southern areas spreading northward through Tuesday night. Rain will become heavy at times Wednesday as the low intensifies. If you’re travelling Wednesday, expect slow going on interstates 95, 93, and 89 due to wet conditions. Snow will be confined to far NW VT, upstate NY, PA, OH, and the mountains of the Southern Appalachians. Snow amounts could be quite hefty in areas where lake effect off the northwest winds behind the storm could add to totals. Amounts on the order of 3-6″ will be most common though lake effect zones could see upwards of 8″. Winds will strengthen out of the southwest tomorrow in anticipation of the storm. This will bring in warmer air resulting in the precipitation being mostly rain. On Wednesday, winds will become very strong out of the SW gusting close to 50 or 55 mph by evening. This combined with the saturated ground will likely cause power outage problems. Winds will turn gusty out of the NW on Thanksgiving ushering in bitter temps for those crazy enough to line up outside of stores before black Friday. I’ll have another update tonight if the forecast drastically changes, otherwise I’ll be back tomorrow. As the storm slated to hit Midweek approaches, models are beginning to agree that a complex storm system will move up the coast bringing heavy precipitation. However, where agreement is lacking is in terms of precipitation type. 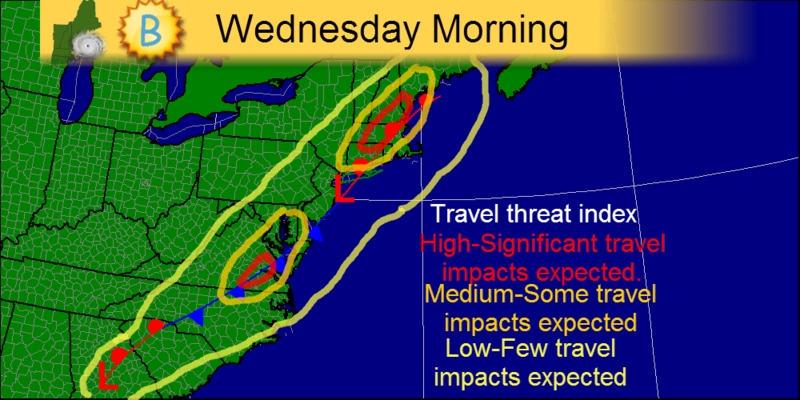 Lets start Wednesday morning when heavy precipitation begins to cause travel problems centered around the I-95 corridor. While low pressure is likely still centered in Georgia, a strong front extending well into Maine will cause heavy precipitation up and down the Eastern Seaboard. Keep in mind that many smaller airports like Portland, ME (PWM), and Hartford, CT (BDL) will also be affected. The map above shows where I expect the most significant ravel headaches Wednesday morning. Areas like SE Virginia and Central New England are in the bulls eye for travel delays Wednesday morning. For those traveling by Train, Bus, or Car, you will likely experience wet and windy conditions on the I-95 corridor starting Tuesday in the South, and Wednesday as you head farther north. Expect slow going around D.C., New York, and Boston especially later in the day as the storm winds up. 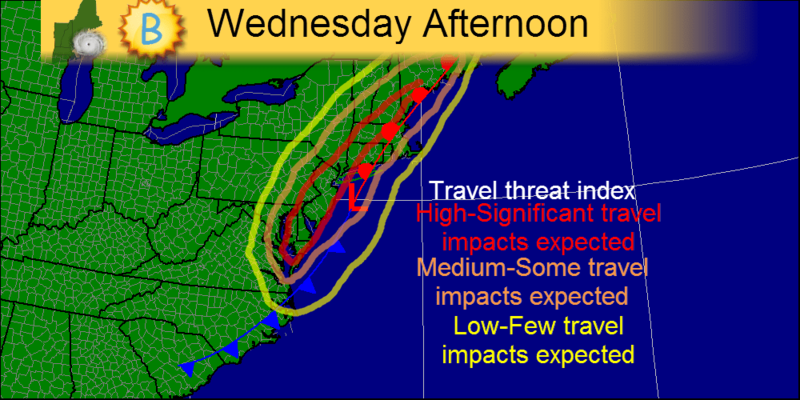 The map above shows where I expect travel to be worst during Wednesday afternoon. Bands of heavy precipitation will be affecting all the major hubs-New York, Boston, and D.C. so significant travel delays are likely. I will most likely have another quick update tonight. 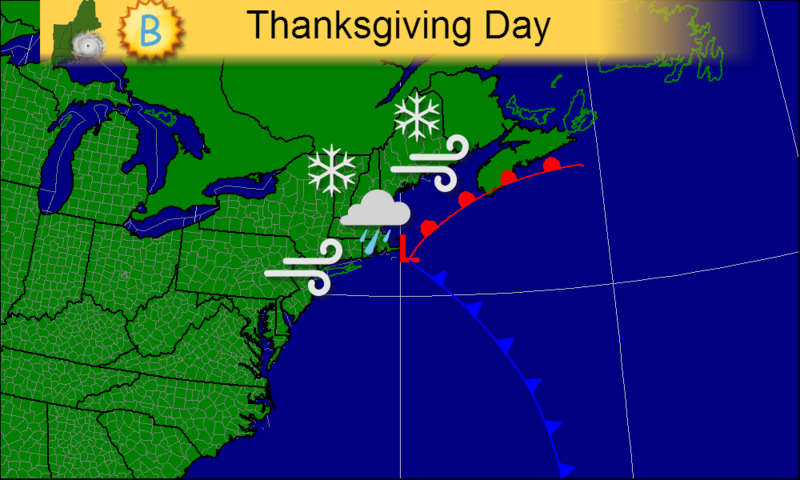 Thanksgiving week forecast-Turkey day storm? As we head into Thanksgiving week, the weather will continue to be active. We have a strong cold front that will move through tonight with a round of sleet, freezing rain, rain, and, for the highest elevations, snow. 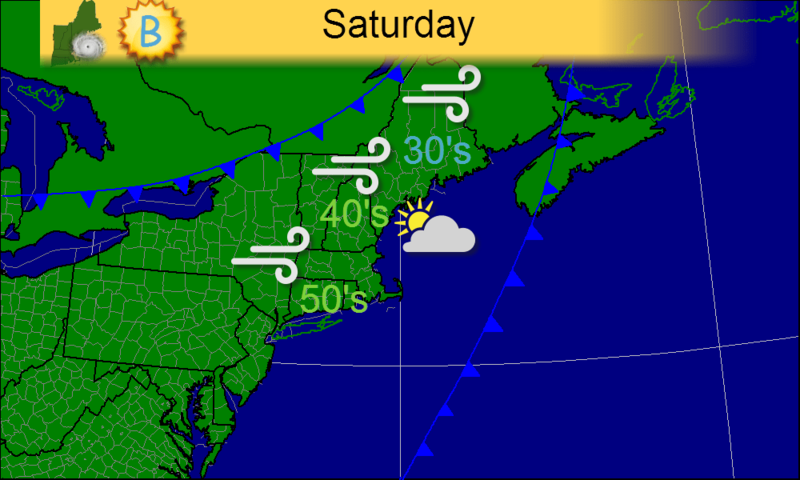 For Saturday, reasonably nice conditions will dominate with sunny skies, cool temps and gusty winds. Saturday night will feature the passage of an arctic cold front that will usher in the coldest air of the season along with some very gusty winds. Mostly sunny and breezy conditions can be expected for Sunday. Monday, winds are still active although they will calm down as the evening progresses. 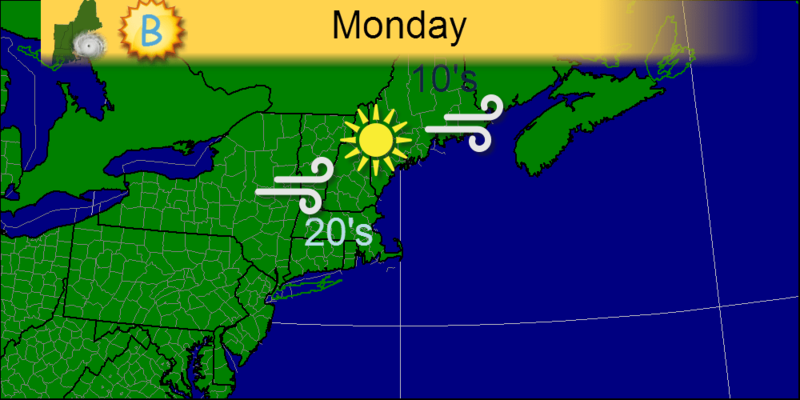 Mid-winter like highs will dominate with highs in the 10’s and 20’s down even to Cape Cod and the CT coast. Full sun will again take full command of the skies. Tuesday will feature the passage of a weak warm front resulting in nothing more than an end to the incessant NW winds and an increase in clouds. This begins our hyperactive weather pattern for the week. Wednesday is where it starts to get interesting for some. 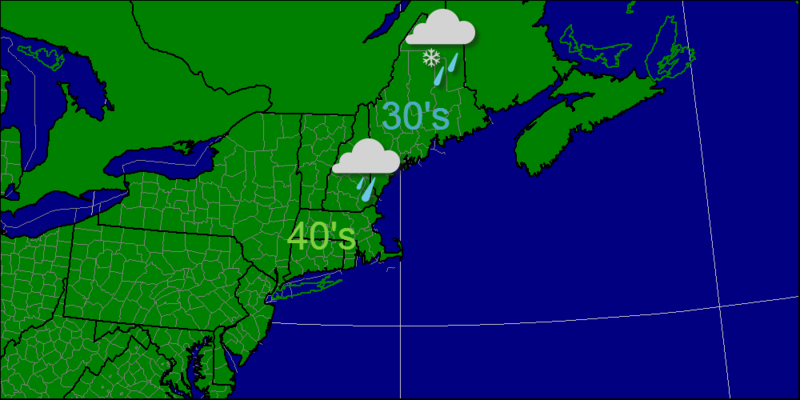 Here in New England, CT and RI will begin to feel the effects of the storm with light rain late in the day. Winds will also begin to increase during this time reaching 15-20mph by sundown. Regarding the larger picture, low pressure begins to organize off the VA coast in 2 separate areas. The models diverge at this point as to the strength and position of both lows however, raw conditions are likely to affect parts of Delaware and southern New Jersey as well as the Outer Banks of North Carolina. Model guidance is rather shaky regarding the development and placement of the lows so uncertainty is high. As Thanksgiving Day rolls around, the storm could really get going off the New England coast pushing precipitation ashore. At the moment, it looks like cities like Boston, Providence, and New York will stay all rain however cities like Hartford, Springfield, and even Portland Maine will see frozen precipitation at some point. It’s too early to talk amounts, but travel disruptions will be major regardless. I’ll include 2 maps below: one for just New England, and one for the entire NE US. The map above is for the afternoon, while the low is pulling away. Precipitation should stop by 2-3 depending on the eventual timing of the low. As I said before, the forecast is uncertain especially 6 days out so the forecast will most likely change. This map is for the morning hours-what looks to be the height of the storm at this point. Stay tuned as the forecast will likely evolve over the coming days. Happy Thanksgiving! 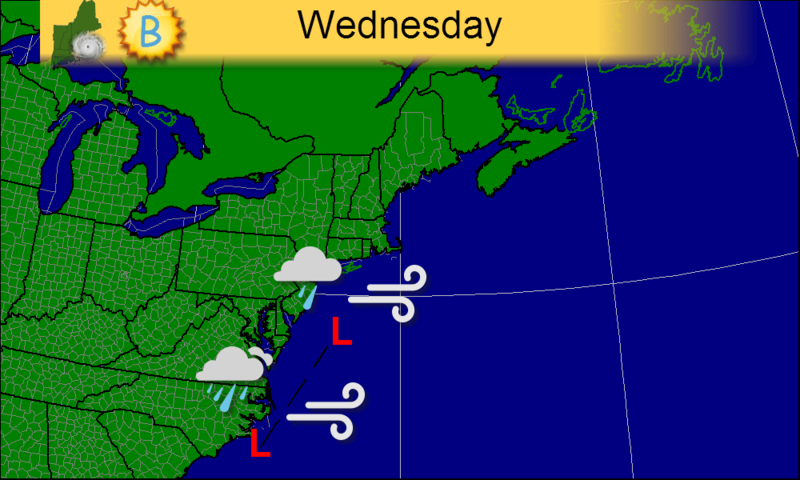 Today, a weak warm front will move through followed by a stronger cold front. This morning’s precipitation is a result of the warm front and will remain a wintery mix inland. At the coast, light rain is expected. This afternoon, there may be a window after the warm front passage and before the cold front arrives. 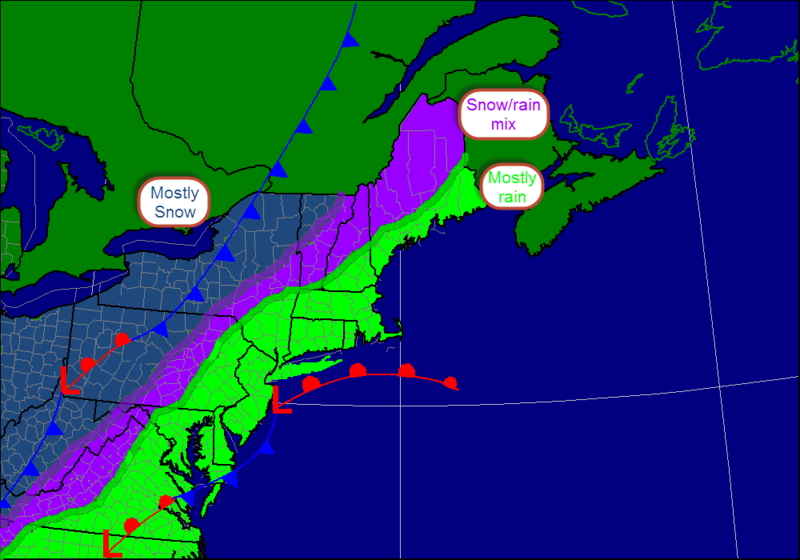 The cold front will feature snow in the highest elevations with predominantly liquid precipitation elsewhere. Looking ahead, another cold front sweeps through Saturday with arctic air invading early week. Beyond that, there is a significant threat for a Nor’easter on Thanksgiving or the day before. Today will feature full sun with more seasonable conditions. 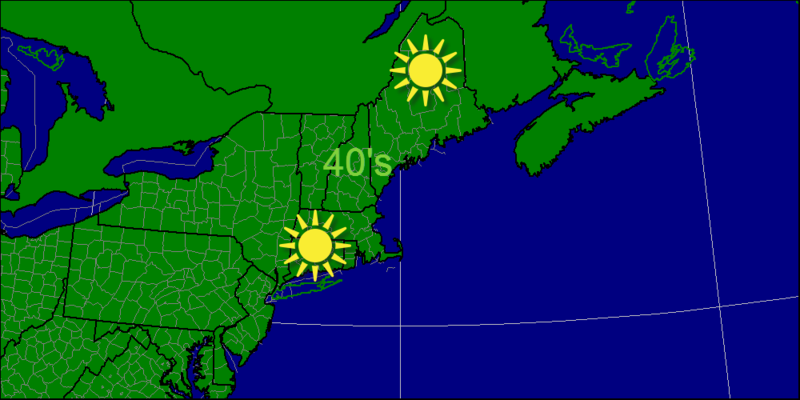 Temps will rise into the 40’s as high pressure slides offshore. Looking ahead, tomorrow features the chance for a shower while next week looks very chilly with highs struggling to break the 32 mark.